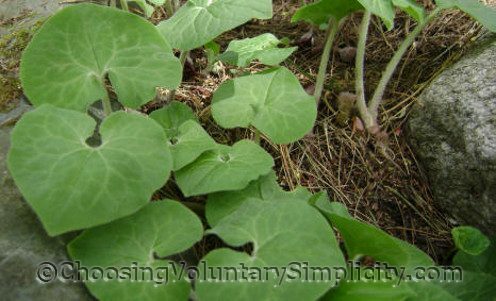 Wild ginger (Asarum canadense) is a member of the birthwort family. It prefers moist, well-drained soil and is usually found in shady, wooded areas. The leaves are large… from three to six inches across… and are thick and fuzzy and have prominent veins. Leaves are heart-shaped and grow on long stalks that start at the base of the plant. Usually the top of the leaf is a deep green and the underside is a somewhat lighter color, but leaf color can vary depending on soil and growing conditions. There will be one flower per plant, right at the very bottom of where two of the long leaf stalks join. 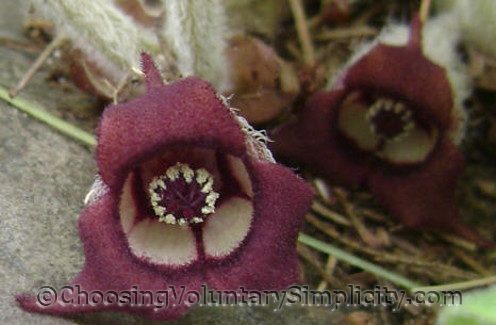 The flowers are cup shaped with three pointed lobes and twelve stamens and are a vivid red color with dark purple and cream markings. Because the flowers are so close to the ground, they are pollinated by crawling insects like beetles and ants. Small “fruits” form by early summer. Wild ginger flowers are easy to miss unless you know where to look for them. Often the flowers are practically lying on the ground and may be almost covered with last autumn’s fallen leaves… but they’re worth searching for because they are really quite beautiful. 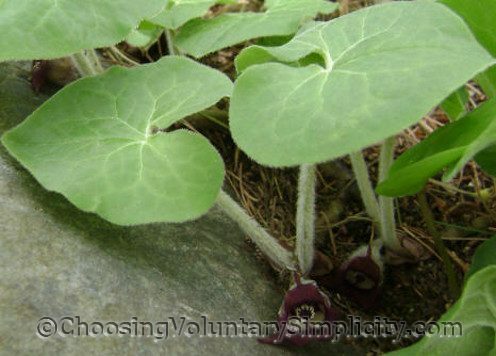 Wild ginger is very easy to grow. It needs humus-rich soil and likes moisture, but good drainage is a must. It spreads through its roots, and a single plant will quickly become a dense mound. Note: Wild ginger smells like the real ginger, but it should NEVER be eaten. Although history tells us that it was once used for various medicinal purposes, it has caused kidney failure and death. Also, parts of the plant contain aristolochic acid, a substance that scientists currently believe could be carcinogenic. Would you believe I had never noticed that there were flowers? There is wild ginger growing in a park nearby and I did notice the scent one day when my 2yo picked off a leaf and brought it to me to smell, but I never saw any flowers. We were in the park today and I looked at the base of the plant like you said, and sure enough there was a flower. Learn something everyday I guess! Anyways thanks. I visit here all the time. Isn’t life funny sometimes. I have some of this at the edge of a flower garden in my backyard but I had no idea what it was. I was always intending to look it up but never did and I came to this blog and was reading some of your articles and came across this one and there it is. I am impressed by the amount of information being shared in this blog, your photographs are lovely. Thanks for making the effort to bring these great articles to the world. This post brings back a lot of memories. My grandmother used to have a big patch of this wild ginger in her backyard and I always used to think it was pretty when I went to visit her. Reading this article made me think of my grandmother again. I always enjoy coming to this blog, there’s always something here that makes me think. Thanks for taking the time to contribute!